Jack Hussell, Morgan Cartwright and Bailey Rhoades, three Washington Middle School artists, were also honored for their work on the “Restore the Roar” campaign T-shirts. The following students (not all pictured) qualified for the state DECA and Business Professionals of America competitions: Hugh Silberman, second place Principles of Business Management; Megan Gruber, third place Principles of Marketing; Eli Lynch, second place Principles of Marketing; Dallas Redman, third place Principles of Hospitality; Brooklyn Devenport, second place Principles of Hospitality; Tony Kuenzli, second place Principles of Finance; Jacob Vanmeter, first place Business Finance; Samantha Sever, second place Business Service; Sam Schroeder, second place Food Marketing; Shrey Maniya, first place Hotel Lodging; Christina Luebbe, first place Quick Service Restaurant; Brock Morris, third place Marketing Communication; Grant Patterson, second place Human Resource Management; Kieara Hites, third place Restaurant Food Service; Tabby Woods, first place Business Law and Ethics Team; Hailey Snyder, first place Business Law and Ethics Team; Spencer Minyo, second place Marketing Management Team; Jack Luebbe, second place Marketing Management Team; Max Schroeder, first place Marketing Management Team; Keiya Satoh, first place Marketing Management Team; Halli Wall, first place Hospitality Team; Kara Vohra, first place Hospitality Team; Kayla Welling, second place Travel & Tourism Team; Aria Marting, second place Travel & Tourism Team; Alan Bailey, first place Travel & Tourism Team; Blaise Tayese, first place Travel & Tourism Team; Trevor Minyo, first place Retail Merchandising and Alex Behrends, a Laurel Oaks student, first place Java Programing and second place Fundamentals of Web Design in the BPA. Also honored were members of the seventh grade Washington Middle School Lady Lions basketball team who recently won the first Frontier Athletic Conference (FAC) championship for the seventh grade girls. The girls being honored were (not all pictured): Addison Chambers, Kendall Dye, Madison Haithcock, Jordan McCane, Kayli Merritt, Allison Mongold, Kaelin Pfeifer, Megan Sever, MacKenzie Tyler, Abigail Wilson and Natalie Woods. 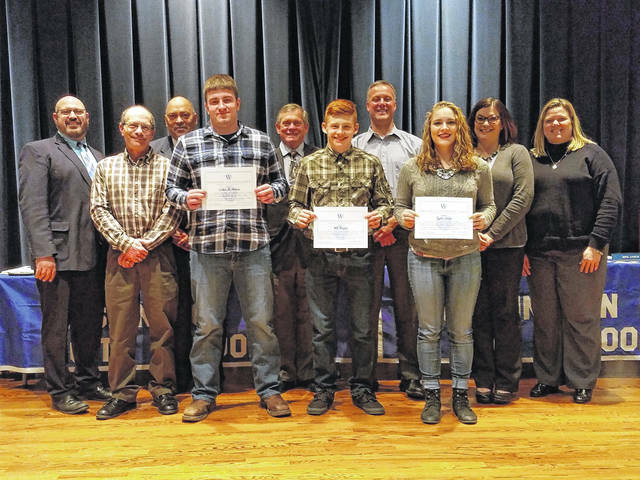 The Washington Court House City Schools Board of Education honored students during its monthly board meeting Monday evening at Liberty Hall. Three students were honored with the Blue Lion Challenge Coins 10, 11 and 12. Colton McNichols, Will Baughn and Taylor Smith are pictured with the board of education Monday evening. 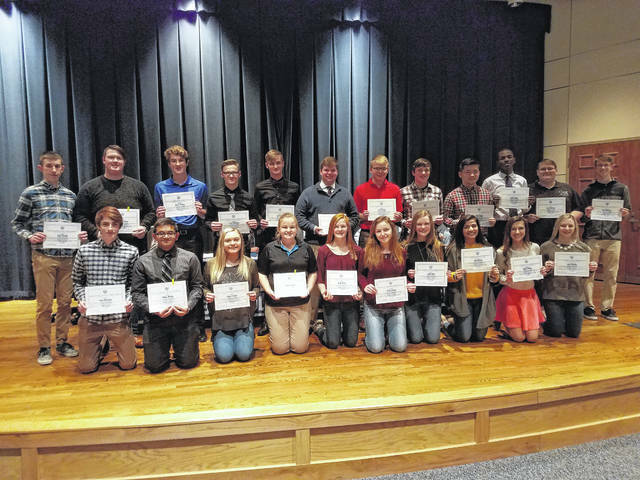 The Washington Court House City Schools Board of Education honored nearly four dozen students during its regularly-scheduled board meeting on Monday evening at Liberty Hall. Superintendent Tom Bailey and the school board took time Monday to honor student achievement during the monthly meeting. Between t-shirt designers and state qualifiers, over 30 students were in attendance to receive an award throughout the evening. Prior to introducing and honoring these students, Bailey took time to update the crowd on the “cultural blue print” the district adopted when Bailey came to work for Washington City Schools. 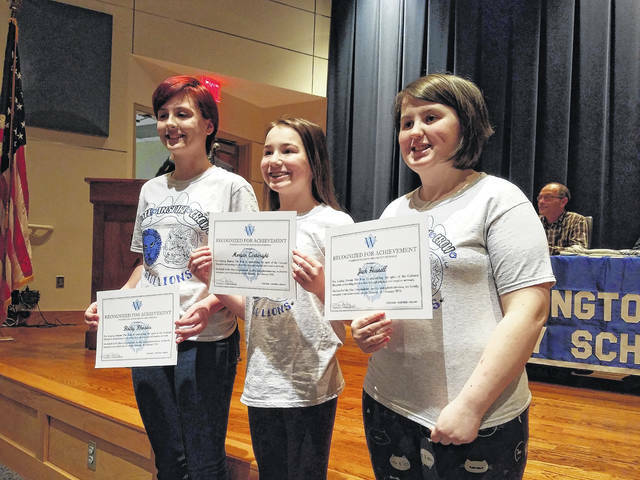 The first students honored were Jack Hussell, Morgan Cartwright and Bailey Rhoades, three Washington Middle School artists who worked on the “Restore the Roar” campaign t-shirts. These t-shirts were voted on by their peers and made available to students and faculty to help show off Blue Lion spirit. The students brought t-shirts for the board during the meeting. The second group honored was a large DECA state qualifier group and one student who qualified to go to the state Business Professionals of America (BPA) competition from Washington High School. Around 30 total students qualified for the state competitions – which will be held in a few weeks – in various business-related events, including business marketing, fundamentals of web design, and travel and tourism. Utilizing business-based teachings, most of these students successfully placed at the recent DECA district competition – some even managed to win their respective event – and will move onto the state competition. Following the state DECA competition, any student who qualifies for the National DECA Competition will travel later this year to Atlanta, Ga. to face off against the best the nation has to offer. Students who qualified for the state DECA competition were Hugh Silberman, second place Principles of Business Management; Megan Gruber, third place Principles of Marketing; Eli Lynch, second place Principles of Marketing; Dallas Redman, third place Principles of Hospitality; Brooklyn Devenport, second place Principles of Hospitality; Tony Kuenzli, second place Principles of Finance; Jacob Vanmeter, first place Business Finance; Samantha Sever, second place Business Service; Sam Schroeder, second place Food Marketing; Shrey Maniya, first place Hotel Lodging; Christina Luebbe, first place Quick Service Restaurant; Brock Morris, third place Marketing Communication; Grant Patterson, second place Human Resource Management; Kieara Hites, third place Restaurant Food Service; Tabby Woods, first place Business Law and Ethics Team; Hailey Snyder, first place Business Law and Ethics Team; Spencer Minyo, second place Marketing Management Team; Jack Luebbe, second place Marketing Management Team; Max Schroeder, first place Marketing Management Team; Keiya Satoh, first place Marketing Management Team; Halli Wall, first place Hospitality Team; Kara Vohra, first place Hospitality Team; Kayla Welling, second place Travel & Tourism Team; Aria Marting, second place Travel & Tourism Team; Alan Bailey, first place Travel & Tourism Team; Blaise Tayese, first place Travel & Tourism Team; and Trevor Minyo, first place Retail Merchandising. Alex Behrends, a Laurel Oaks student, was also honored for his first place Java Programming and second place Fundamentals of Web Design in the BPA. The next group honored were the members of the seventh grade Washington Middle School Lady Lions basketball team, who recently won the first Frontier Athletic Conference (FAC) championship for the seventh grade girls. Addison Chambers, Kendall Dye, Madison Haithcock, Jordan McCane, Kayli Merritt, Allison Mongold, Kaelin Pfeifer, Megan Sever, MacKenzie Tyler, Abigail Wilson and Natalie Woods all received awards for the FAC championship and were praised by the crowd for their hard work. Finally, three students were honored with the Blue Lion Challenge Coins 10, 11 and 12. These numbered awards are given out to students who have had a big impact through their education, athleticism or talents. The challenge coin is awarded for “aiming high and achieving greatness,” according to Bailey. The first student honored was Taylor Smith, who received challenge coin 10, after she was named the state winner of the Dr. Martin Luther King Jr. Art Contest. The second student receiving a challenge coin, number 11, was Will Baughn who was named an FAC wrestling league champion in his weight class. The final student, who received challenge coin 12, was Colton McNichols, who was also honored as an FAC wrestling league champion in his weight class. Following the presentations, the board resumed its normal flow and continued with the superintendent’s report, which consisted mainly of employment requests, calendar and handbook approval, and facility use requests. All were passed unanimously by the school board of education. Treasurer Becky Mullins then gave her report, which included January financial reports, amended appropriations for 2018, donation and fund acceptance, and more. Finally, Lynch asked for any old business to discuss and a majority of this time was used to talk about two potential options for a new “Performing Arts Center.” The options Bailey presented were: build this new facility on the Washington Middle and High School campus or renovate the current Historic Washington Middle School Auditorium. During this discussion, pricing based on crude estimates was brought up for these projects. Following a discussion with a construction professional, Bailey suggested the renovation would cost around $5 million and the new facility would be built at a cost of around $10 million to $20 million. Board members still had reservations about both options for a number of reasons, including seating availability, parking availability and other concerns. Additional plans for a new athletic facility were also presented. Stay with the Record-Herald for monthly updates from the Washington Court House City Schools Board of Education. https://www.recordherald.com/wp-content/uploads/sites/27/2018/02/web1_20180226_191738.jpgJack Hussell, Morgan Cartwright and Bailey Rhoades, three Washington Middle School artists, were also honored for their work on the “Restore the Roar” campaign T-shirts. https://www.recordherald.com/wp-content/uploads/sites/27/2018/02/web1_20180226_193012.jpgThe following students (not all pictured) qualified for the state DECA and Business Professionals of America competitions: Hugh Silberman, second place Principles of Business Management; Megan Gruber, third place Principles of Marketing; Eli Lynch, second place Principles of Marketing; Dallas Redman, third place Principles of Hospitality; Brooklyn Devenport, second place Principles of Hospitality; Tony Kuenzli, second place Principles of Finance; Jacob Vanmeter, first place Business Finance; Samantha Sever, second place Business Service; Sam Schroeder, second place Food Marketing; Shrey Maniya, first place Hotel Lodging; Christina Luebbe, first place Quick Service Restaurant; Brock Morris, third place Marketing Communication; Grant Patterson, second place Human Resource Management; Kieara Hites, third place Restaurant Food Service; Tabby Woods, first place Business Law and Ethics Team; Hailey Snyder, first place Business Law and Ethics Team; Spencer Minyo, second place Marketing Management Team; Jack Luebbe, second place Marketing Management Team; Max Schroeder, first place Marketing Management Team; Keiya Satoh, first place Marketing Management Team; Halli Wall, first place Hospitality Team; Kara Vohra, first place Hospitality Team; Kayla Welling, second place Travel & Tourism Team; Aria Marting, second place Travel & Tourism Team; Alan Bailey, first place Travel & Tourism Team; Blaise Tayese, first place Travel & Tourism Team; Trevor Minyo, first place Retail Merchandising and Alex Behrends, a Laurel Oaks student, first place Java Programing and second place Fundamentals of Web Design in the BPA. 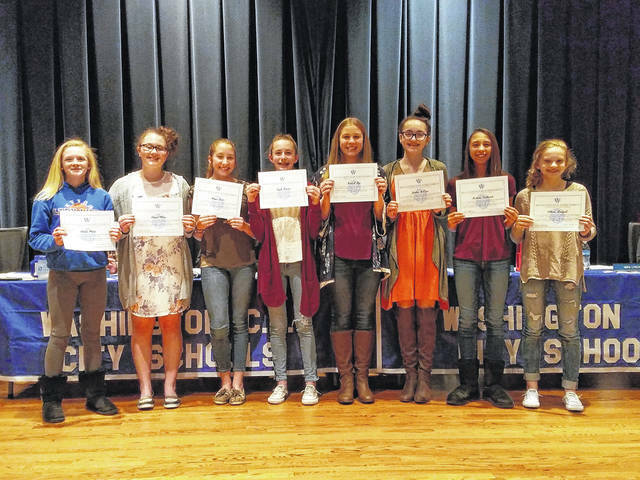 https://www.recordherald.com/wp-content/uploads/sites/27/2018/02/web1_20180226_193508.jpgAlso honored were members of the seventh grade Washington Middle School Lady Lions basketball team who recently won the first Frontier Athletic Conference (FAC) championship for the seventh grade girls. The girls being honored were (not all pictured): Addison Chambers, Kendall Dye, Madison Haithcock, Jordan McCane, Kayli Merritt, Allison Mongold, Kaelin Pfeifer, Megan Sever, MacKenzie Tyler, Abigail Wilson and Natalie Woods. https://www.recordherald.com/wp-content/uploads/sites/27/2018/02/web1_20180226_194025.jpgThe Washington Court House City Schools Board of Education honored students during its monthly board meeting Monday evening at Liberty Hall. Three students were honored with the Blue Lion Challenge Coins 10, 11 and 12. Colton McNichols, Will Baughn and Taylor Smith are pictured with the board of education Monday evening.